Linear perspective is a system of creating the illusion of depth and space on a flat surface. 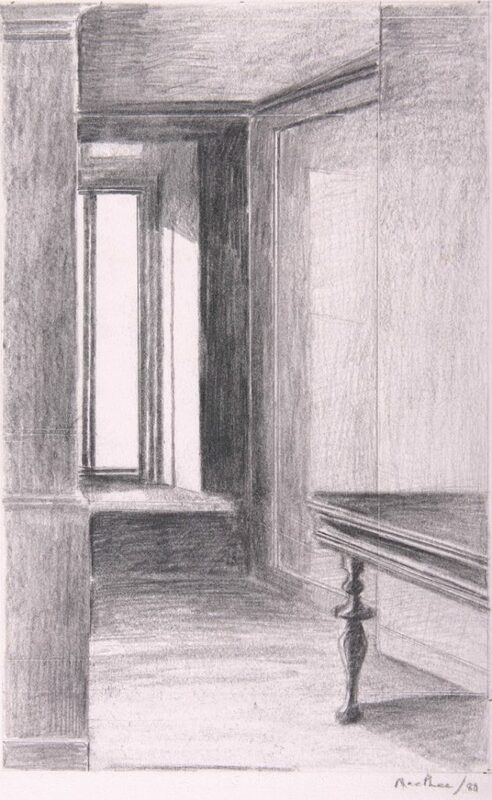 In drawings or paintings, all parallel lines converge into a single vanishing point in the picture’s horizon. The concept of linear perspective was first recorded by the Italian Renaissance philosopher artist Leon Battista Alberti in his treatise Della Pittura (“On Painting”), published in 1435. Miniatures exist in many different cultures where small illustrations were made for books. In Europe, the tradition came from illuminated manuscripts. The earliest extant examples are from the 3rd century, and some of the most intricately painted medieval European miniatures are from the 15th century, to be found in bibles and books of hours, such as the Très Riches Heures du Duc de Berry in Chantilly, France. Closely related to European miniature paintings is the Persian tradition that flourished simultaneously. The Persian style then influenced Mughal Indian miniatures that developed in the 16th-18th centuries. These were used largely as book illustrations or kept in albums. 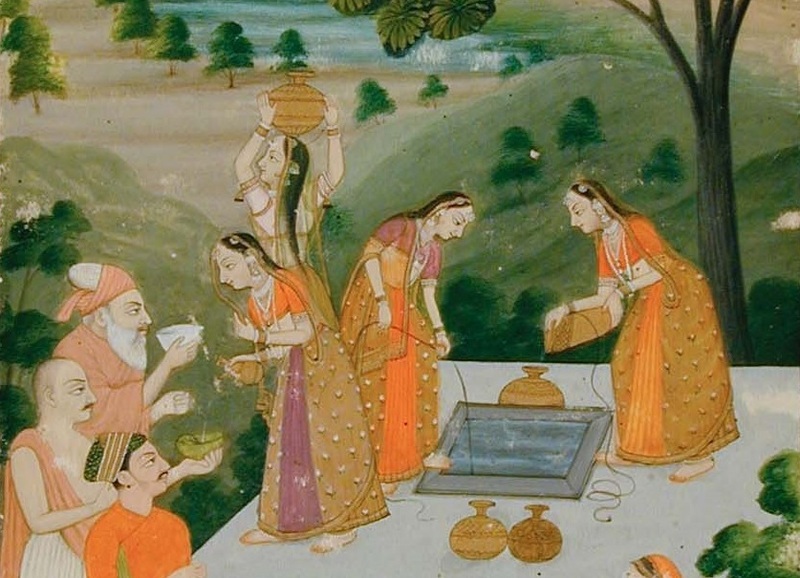 The AGGV’s example below of women drawing water from a well measures 21.5×15 cm. and is in the exhibition Water Work Space. Museology, or museography, is the study of museums, curation, exhibitions, and the role of museum-type institutions in the context of education, social and political engagement. The International Council of Museums (ICOM) was created in 1946 as a network of museum professionals that responds to the challenges museums face in the world today. The Op (or Optical) Art movement flourished in the 1950s with visual artworks that use optical illusions to confuse and excite the eye, giving the viewer the impression of disorientation and movement in the images. Op Art pieces are usually created with abstracted geometric lines and forms, often in black and white. They play on theories of perspective, colour and psychology. Key artists in this art category include Bridget Riley, Victor Vasarely and Frank Stella. 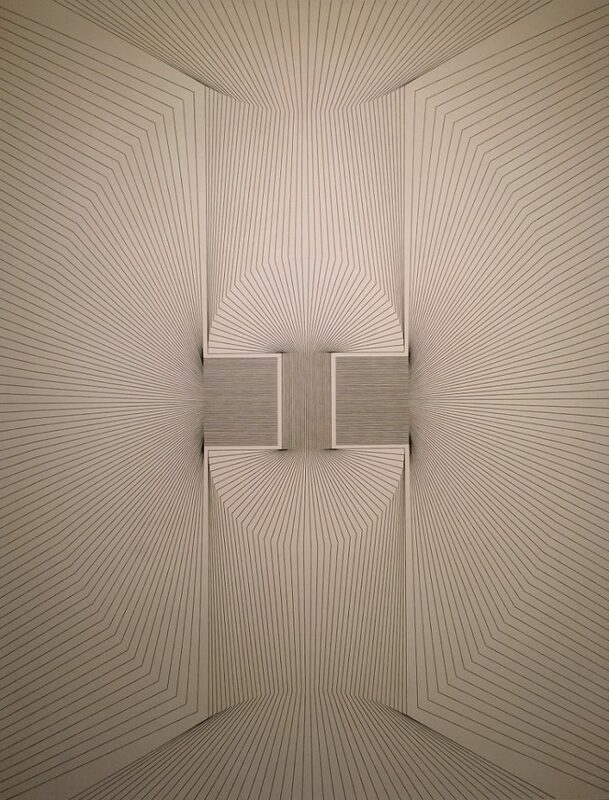 Several of Canadian artist Brian Fisher’s abstract geometric works are aligned with the characteristics of Op Art, including the canvas on exhibit in Beyond The Edges (pictured above), where fine black lines on a white canvas generate the optical effects that are the mainstay of this art movement. A triptych is a work of art that is divided into three sections, usually with a central main panel flanked by two smaller panels. 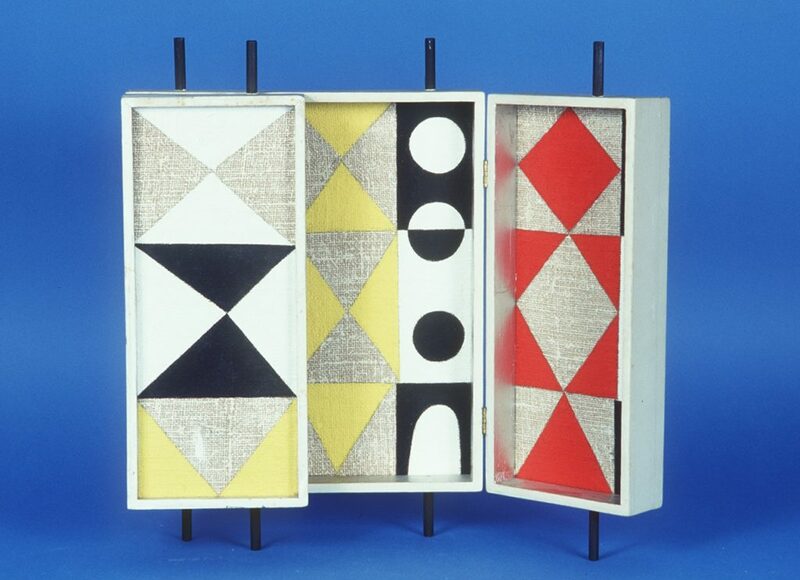 The three panels may be hinged together so that the piece may be folded shut. The triptych arose from early Christian art in the Byzantium period and became the preferred standard during the Middle Ages as an altarpiece. These can still be found in many churches and cathedrals in Western Europe. 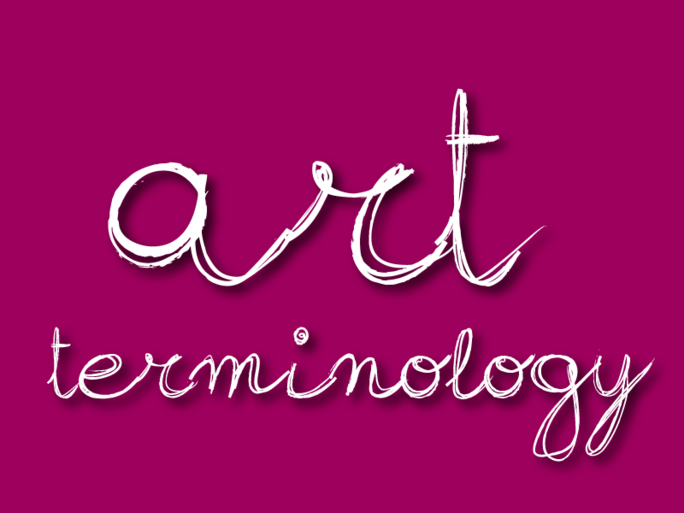 The format has been transmitted through the ages and can be found in both modern art pieces and photographic works. The triptych by B.C. Binning (above) is displayed in Beyond the Edges.